In this blog, we discuss the extra impact your business can gain from, and the benefits of, LED signage, particularly on a plinth sign. Plinth signs are those you see outside of a company’s main factory, corporate headquarters, hospitals, hotels, and shops. 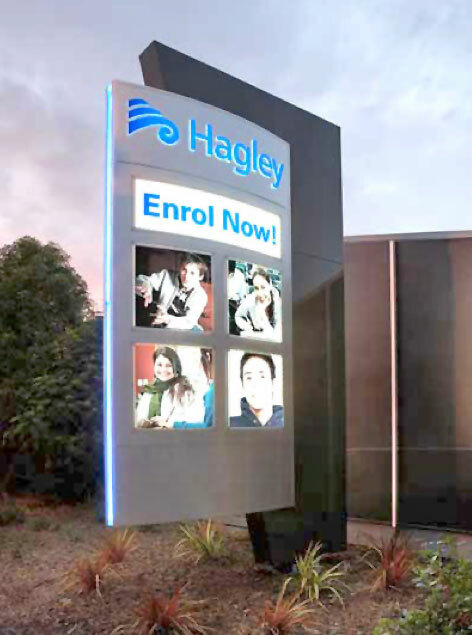 Your local Signwise branches in Auckland, Christchurch and Wellington can help you determine the right plinth signage for you. Plinth signs are impactful, mainly due to their stature, but did you know that it’s easy to incorporate an LED lighting element on your plinth sign for that extra impact? LED lighting consumes a lot less power as compared to the traditional neon or fluorescent style lights. Therefore, you get all the impact of an illuminated sign, at a much lower running cost. LED lights can retain their brightness for up to 100,000 hours – almost a full five years longer than fluorescent and neon lights. This means they are a lower maintenance option. As well as their long life, the brightness LED lighting emits does not diminish, because they don’t have any gas that can leak out and cause a dull light over time, as with traditional lighting. There’s nothing worse when a sign is only lit up in certain places - this does not in-still great confidence in a company! As LED lighting does not use glass tubes, like the old, long fluorescent lighting of the past, there are far greater signage options. This is why LED is a fantastic solution for plinth signage, where it may be tricky and intricate illumination needed to create the full impact. LED lights work well in outdoor settings such as your plinth sign, and don’t need significant protection from New Zealand weather, unlike other lighting.